This is a retrospective plan made from an earlier drawing. 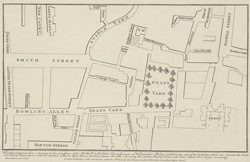 It shows the buildings that once covered the southern half of Deans Yard. Among these are the Quaker Meeting House, the Quaker School, the Little Almonry and the Alms Houses.